One Billion Minds » Buzz Anytime! Home > Popular > Buzz Anytime! The differentiator of our service is human assisted search. Imagine google on your smartphone when there is no 3G. It was in the middle of March 2012. I, Rashmi Mehta was working in Lupin Pharmaceutical as a management trainee and was unable to understand a few words getting thrown about in an official meeting. We have all been in such awkward moments, greenhorns in our first jobs! With no smartphone at hand, I waited to get back to my desk and Google the stuff. If only there was some way of getting an answer to any question instantly. One thing led to another and finally one day I launched my idea of a platform where questions will be answered instantaneously using the simplest means available to anybody, as simple as an SMS! The initial days were full of mixed feelings - excitement and confusion, but my parents who taught me to follow my passion right through to the end, stood behind me. Finally I decided to take this challenge up whether it meant leaving my job or ending up in a big failure or any other such disaster! Motivating myself with the idea that there was not much to lose I went into the basics, started the research myself! With that, more people stepped into the story… Pooja, a cousin, played a big role in validating the idea and helped me understand the market potential. I was overwhelmed when Anurag, an MBA classmate and a finance geek joined the team. Meanwhile Amit Mehta, a techie by profession and an entrepreneur at heart said that he would take care of the technology and asked us to focus on validating and building the product. And less than a year later, there was a product! Buzzanytime - an SMS search service for everybody with a human touch. 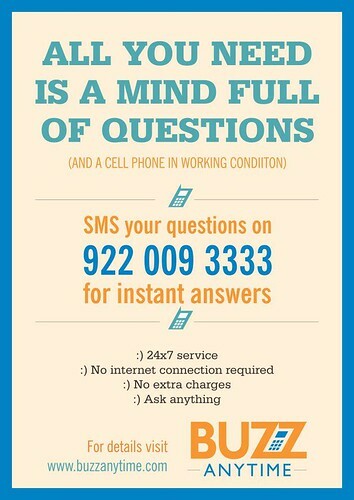 People can type in any query and send it to 9220093333 and they get a reply within minutes! The key value is in providing relevant answers, which means that our Search Captains validate answers before sending. It is the easiest way to get precise answers to your queries. Unlike search engines we do not give links, we provide answers! So, saves the time and hassle for getting the exact information you are looking for. We receive about 300 - 350 queries per day without a single penny spent on marketing. People ask questions from anything to everything, students enquire about their exam results through SMS, while housewives enquire about the rate in the city of some vegetable they wish to buy in the evening. + Which restaurants are open in Mumbai at 2am? + Market Capitalisation of Microsoft? + What shall I do for my Dad’s birthday, any suggestions? We have developed a semi-automated system that can answer routine questions like - What is the capital of Mizoram - within a minute. More complicated questions like - How many songs has Lata Mangeshkar recorded since 1990 - requires human intervention. With just four employees, offering the service 24/7 is a challenge, but most queries are currently answered in 5 minutes. We aim to reduce this turnaround to 2-3 minutes as they scale up operations. We have been selected at Kyron accelerator, Bangalore and are now planning to expand our operations. We are really excited to see how this service can help millions who don't have access to internet on the go! We want to create this change for good and want that people shall not be afraid of asking questions, not any more. Ab Askega Hindustan!! Aha ask us what that means!! We are a young team chasing after a counter intuitive idea on first glance. We want to know how to make the service better. Our challenge for you is: Think of a Question. Pick up your phone and text it to +91 922.009.3333. If you like the answer and the speed with which we revert, tell us here what you think we can do better. Remember, it will take a maximum of 5 minutes for our answer to reach you. Have you noticed the comic strips that we use? Check it out on the video. While every response can give us insights to improve our service, we will select THREE of you to receive a custom designed comic strip. We will be in touch if you win to decide together what the comic will be about.